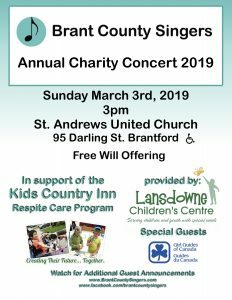 Brant County Singers are committed to the support of local children’s charities. With that in mind, all proceeds of our March charity concert were donated to the Lansdowne Children’s Centre, specifically the Kids Country Inn, which provides respite care for children. Due to the generosity of our attendees, we were able to donate $1200 to this cause.